I feel its been long time I have post a review. Well it was a birthday week which kept me a lot busy..It was amazing and tiring something or the other just keeps on coming. Hope you all too had an amazing week. 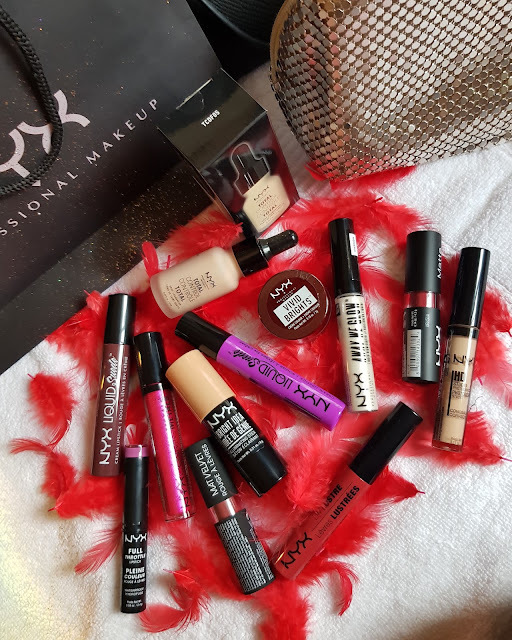 As it was my birthday I really went for makeup shopping to the NYX STORE and picked up some of the new and best selling products. 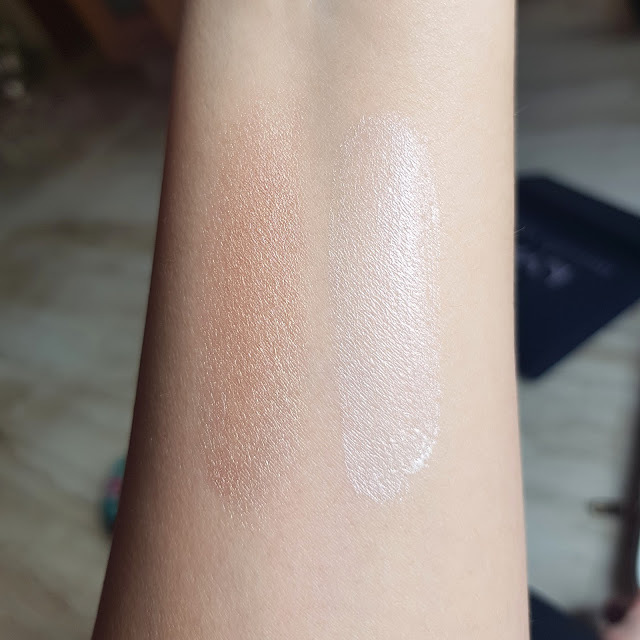 Today I will be reviewing two of the new products that is TOTAL CONTROL DROP FOUNDATION & AWAY WE GLOW LIQUID HIGHLIGHTER in shade LIQUID PRISM. 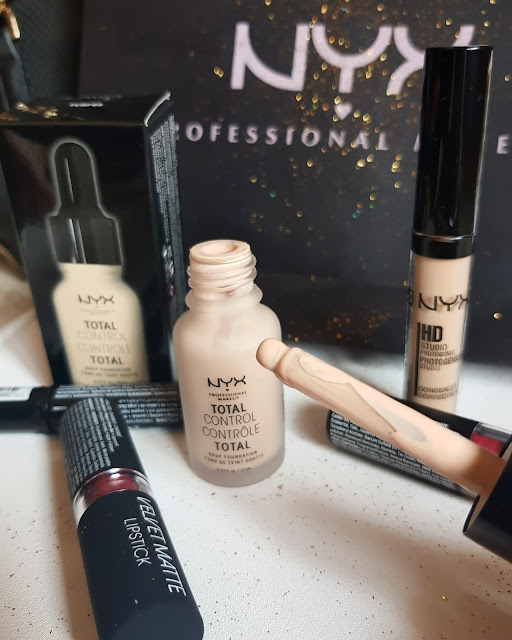 Total Control Drop Foundation comes in many different shades so whether you are pale, light, medium or dark skin you will find your perfect match. You can also use two or more shades for getting a match for your skin tone. 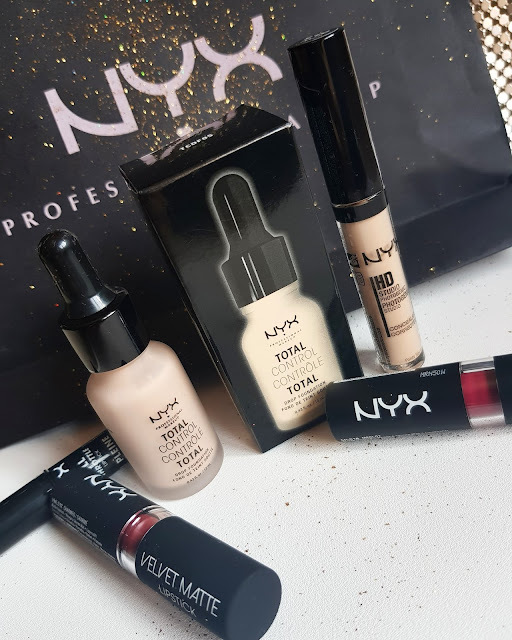 You can also use this drops with other foundations or illuminators. I purchased light shade it’s for fair skin tone with pink undertones. 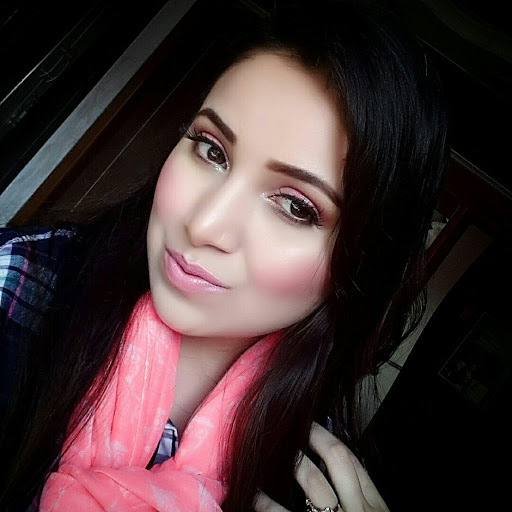 After applying on my face I did felt lighter than my skin tone so I try using it with other darker shade foundation. It comes in a glass bottle with a dropper you can directly put drops on your face like a serum and blend it with the flat foundation brush. The consistency is very thin so be careful you don’t spill around. It spreads evenly on face giving medium coverage. You can build the product to give a complete high coverage. It blends easily into skin giving a silky touch. 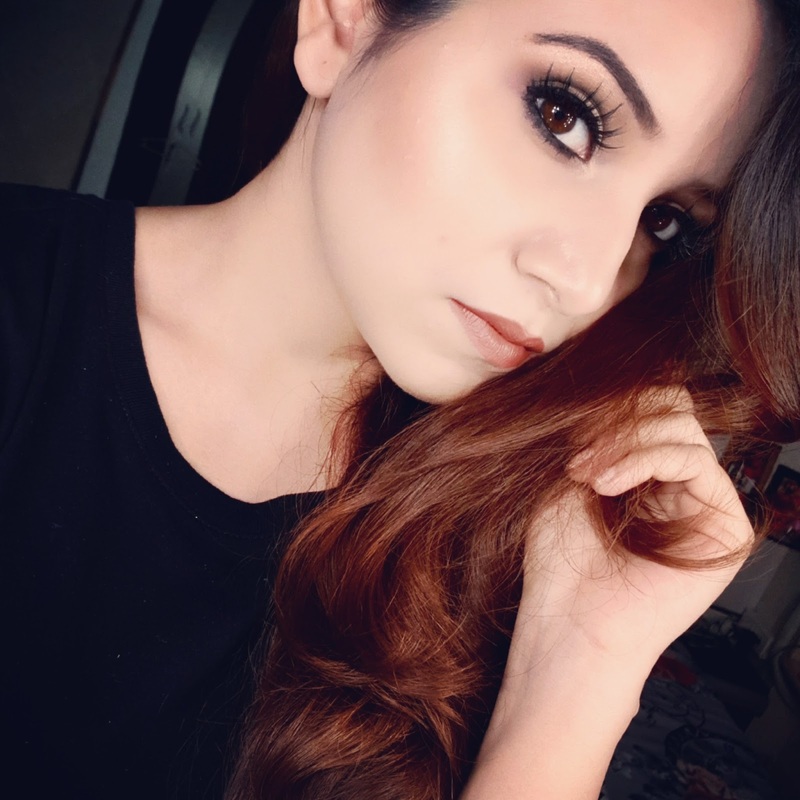 It gives semi matte finish and feels extremely light on skin. I found this foundation is good for normal, oily to combination skin. It doesn’t look cakey and doesn’t settle into fine lines. It doesn’t contain any fragrance. It doesn’t make my Tzone oily after 4-5 hr of application but it does start wearing off from my nose. It doesn’t accentuate pores or fine lines. It doesn’t contain any spf. Also I tried using a beauty blender but due to its runny consistency it was soaking up more product. The bottle is really messy and you can even spoil your clothes specially if you are like me who doesn’t have patience. Overall it’s a expensive drugstore foundation but also worth trying out. I liked its smooth texture and such a lightweight formula. There are lots of shades available for various undertones like pink, yellow and olive. You can also customize shade by mixing different foundation shades. 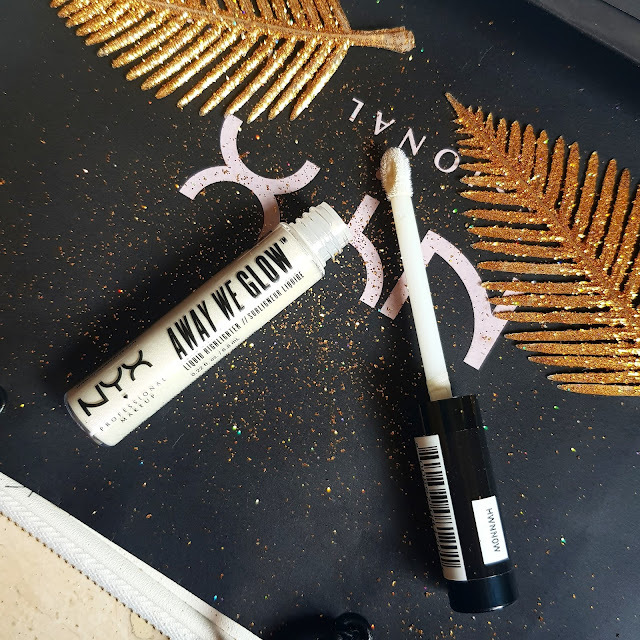 Coming to Away We Glow it’s a liquid highlighter which comes in a tube and a soft applicator, there are 5-6 shades available. I got LIQUID PRISM shade which is like a holographic highlighter and it suitable for all skin tones. It makes my skin sparkle. 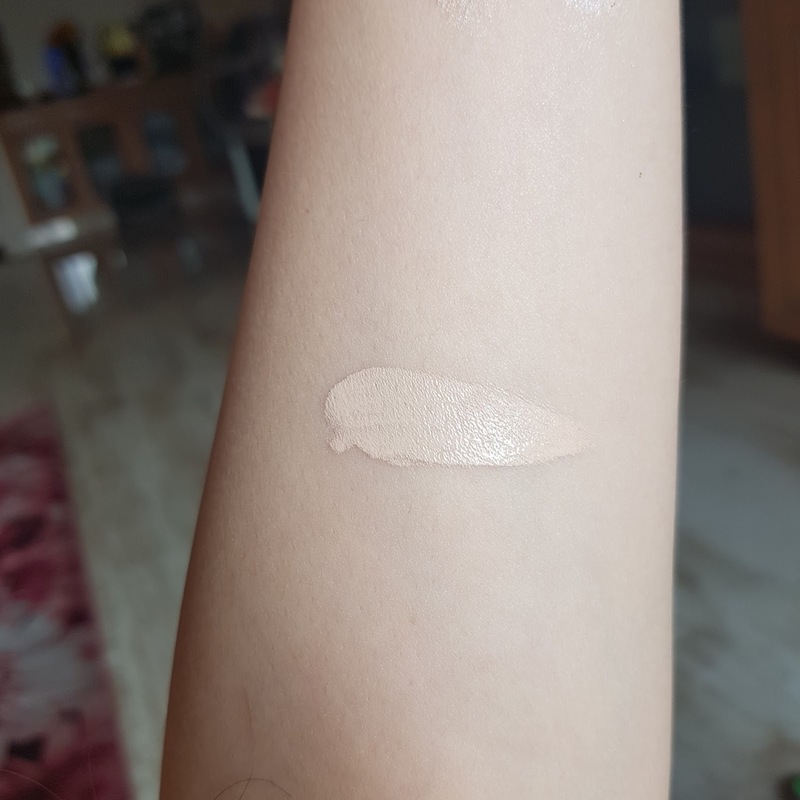 This liquid highlighter can be used for subtle glow or intense Strobing. You can build the product as needed. The texture is very creamy and easy to blend. I tried to use more but it didn’t look harsh instead it just look perfect like a natural glowy skin. It doesn’t emphasise pores or fine lines. As it has a large applicator it can be used on eyelids too. Once the product sets in its difficult to move. 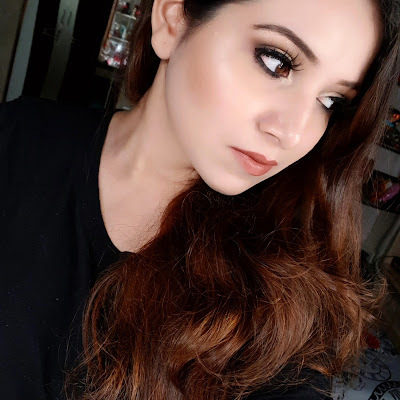 I really loved applicator as its easy to put on cheeks and eyelids. I just try to blend it with finger when I am in a hurry. 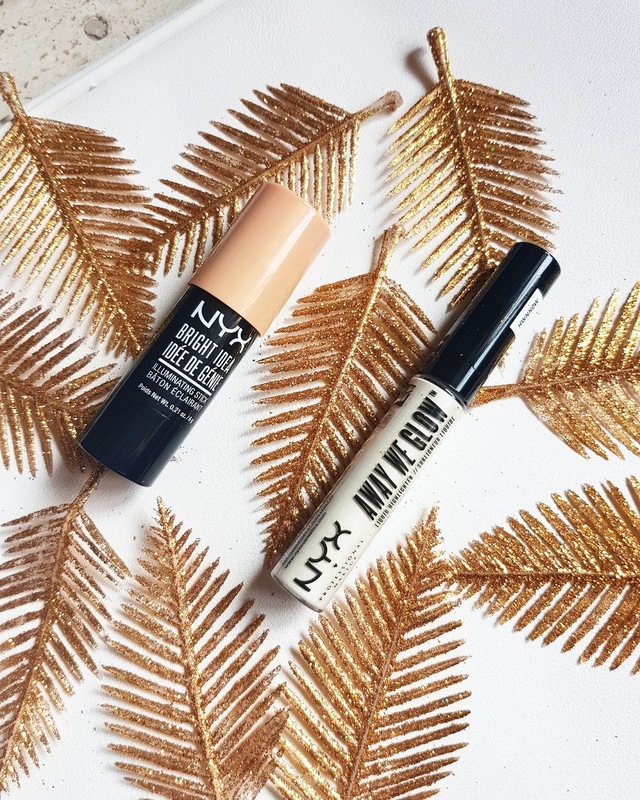 As it’s a liquid highlighter you can use them beneath your foundation or above the foundation. OVERALL I am obsessed with both the products I have been using it since I got them ..I find them very easy to use on work days too. I would recommend it to everyone its totally worth the price. Home remedy contains al natural Indian ingredients which is super cool to try. 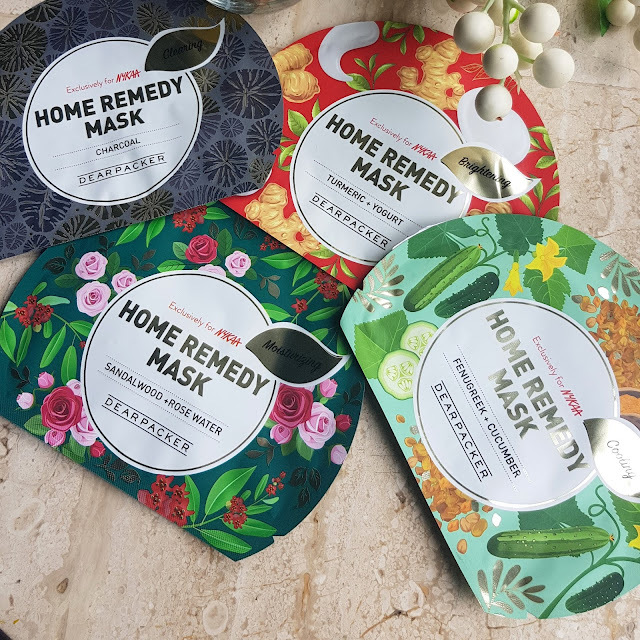 This sheet mask comes in a beautiful attractive colorful packaging. 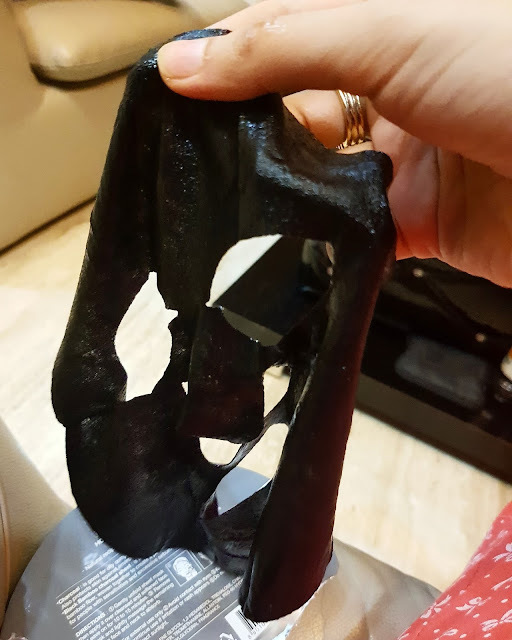 When you open the packet you find a sheet mask which is completely soaked in thick essence. Some of the masks do have fragrance while some of them don’t have it. 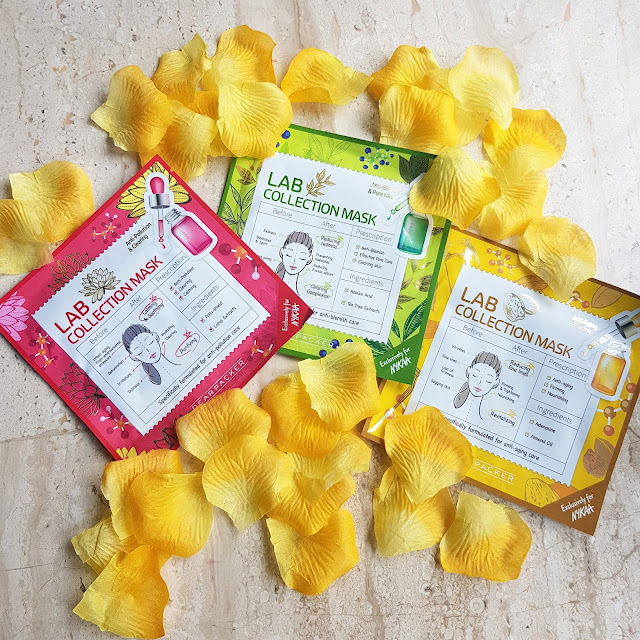 Along with home remedy I also got lab collection sheet mask which are very similar but have combinations of ingredients for particular skin concern. Now this sheet mash perfectly fit on my face I have used various sheet mask like Innisfree, faceshop and Sephora but this one fits better then all. You can use these masks in day time as well as night time. 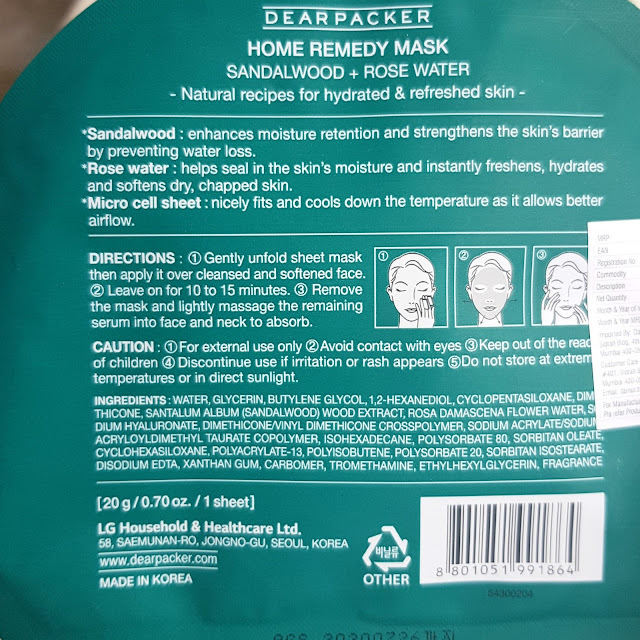 I have just tried 1-2 sheet mask and really made my skin soft and smooth. Some of the mask do a good job of giving radiance and brightening effect. 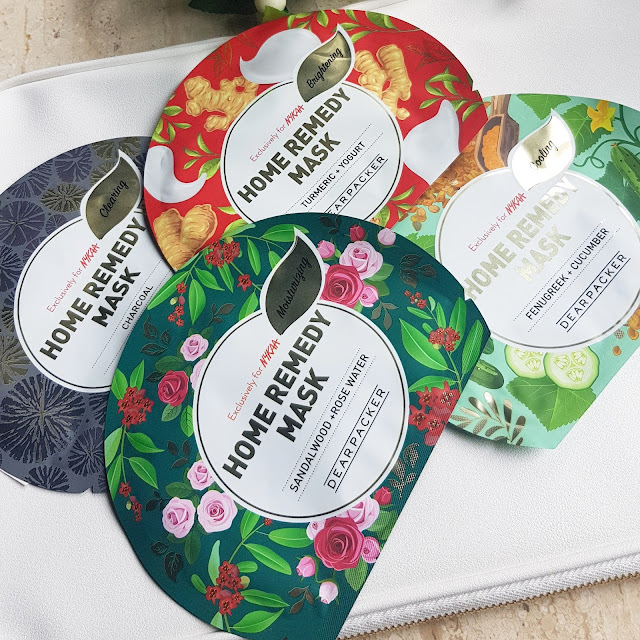 However these sheet masks give temporary and instant results. Like if you are going for parties or attending important events you can use them on a night before. Also it gives freshness to your dull tired skin which is affected with pollution and dirt. 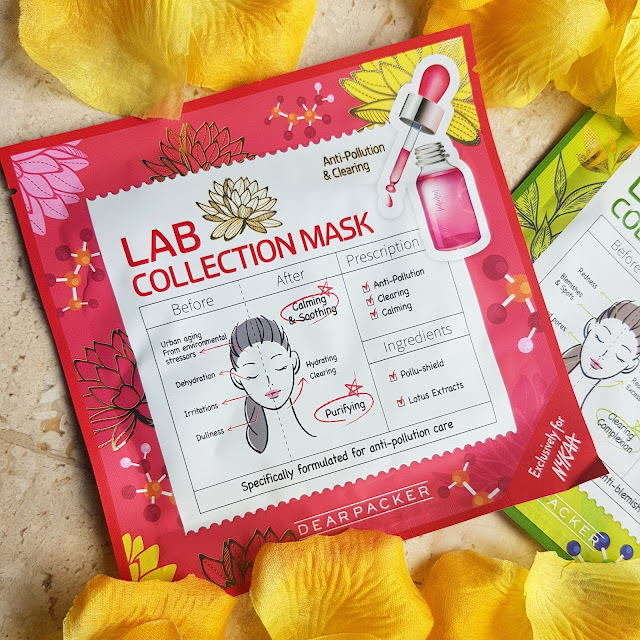 After removing the mask that is 15 mins later you can simply leave the serum on face and gently massage it into skin. Later you can wash your face with cold water. It doesn't feels sticky like other sheet masks . 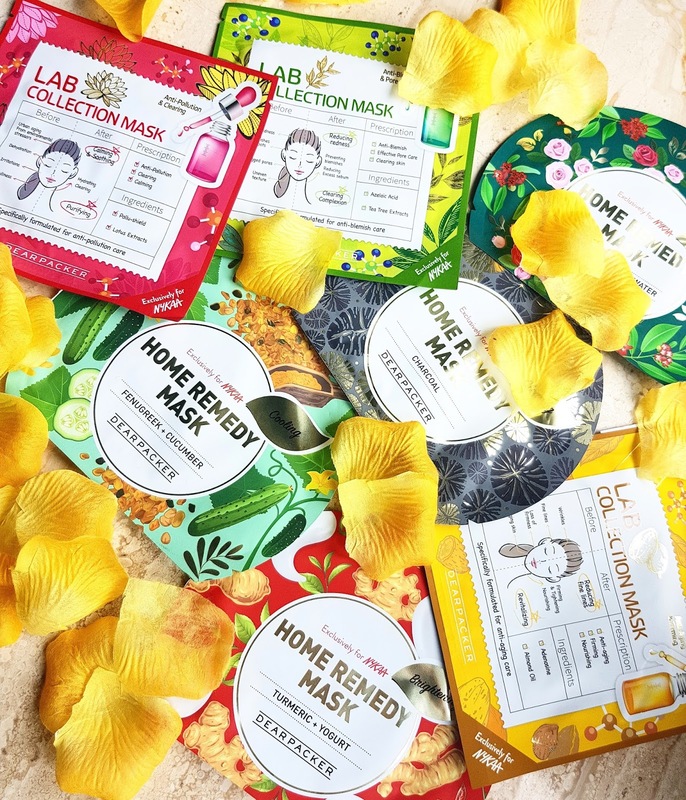 The sheet mask can be used only once. Overall I feel sheet masks are must needed as we travel and use lots of different products our skin doesn’t get time to rejuvenate. Its also good for girls who usually don’t get much time for facials and skin treatments. These are very handy and easy to use. 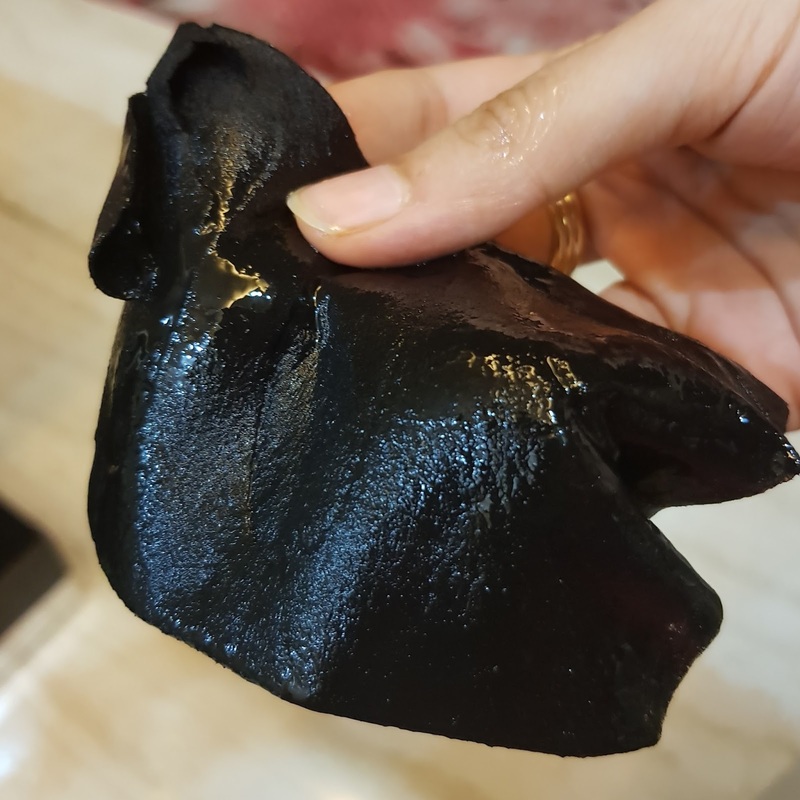 I personally liked using HOME REMEDY MASKS was quite happy with the results also its true to what it claims. They are free from talc, mineral oil, parabens, triclosan & triethanolamine. The sheet mare made from 100% pure cotton. 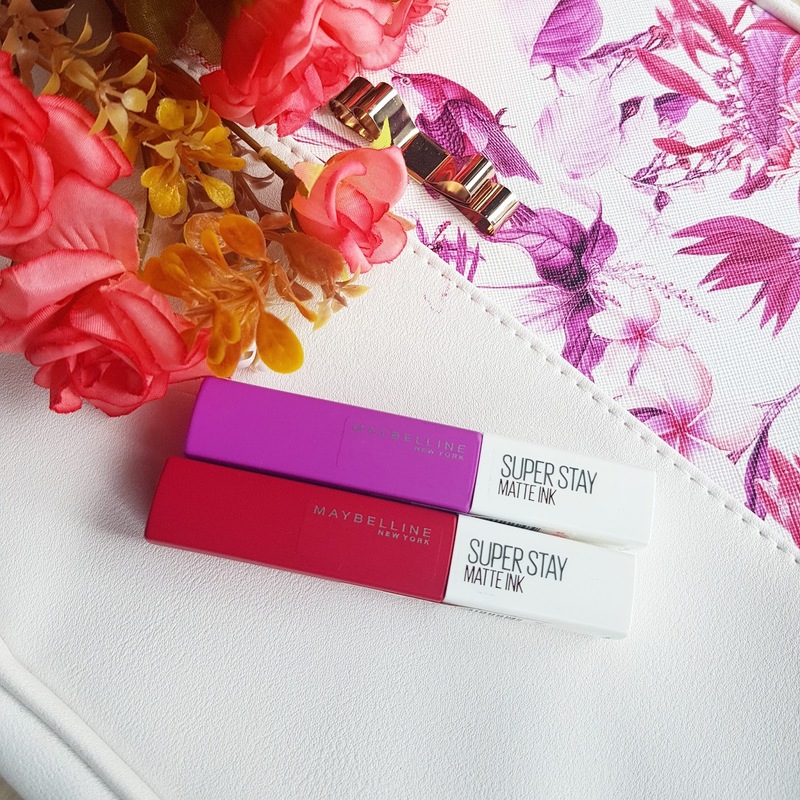 Today I am going to review latest launch from Maybelline New York SUPERSTAY MATTE INK LIQUID LIPSTICK. I got this from Superdrug on my last visit to UK. These range comes in 10 different shades. 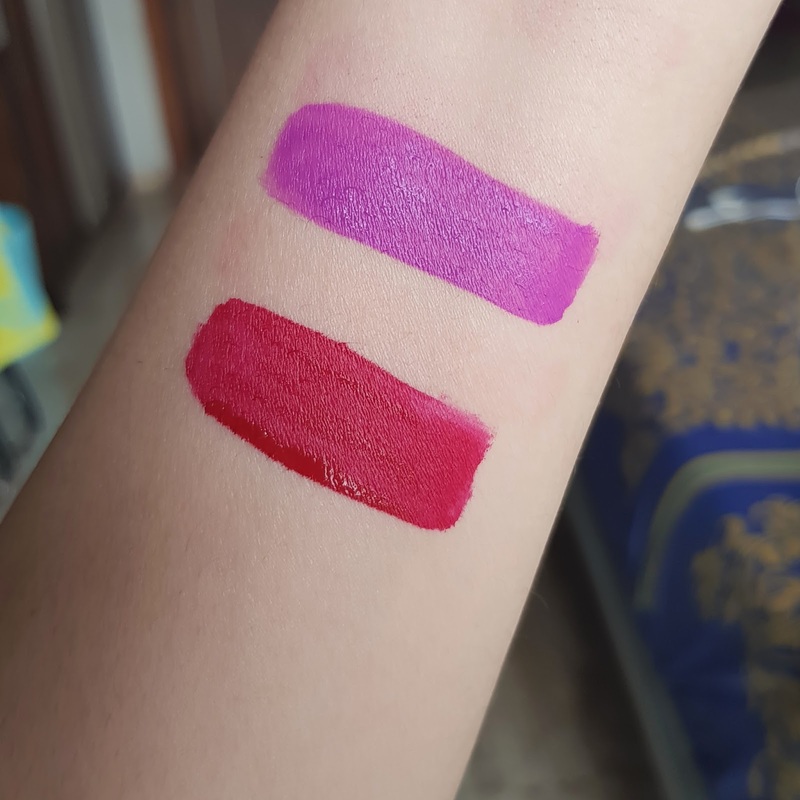 As there was an offer going on I choose two shades from CREATOR & PIONEER. It comes in a square matte color coded tube with a white cap. You can easily differentiate from colors without having to open it. 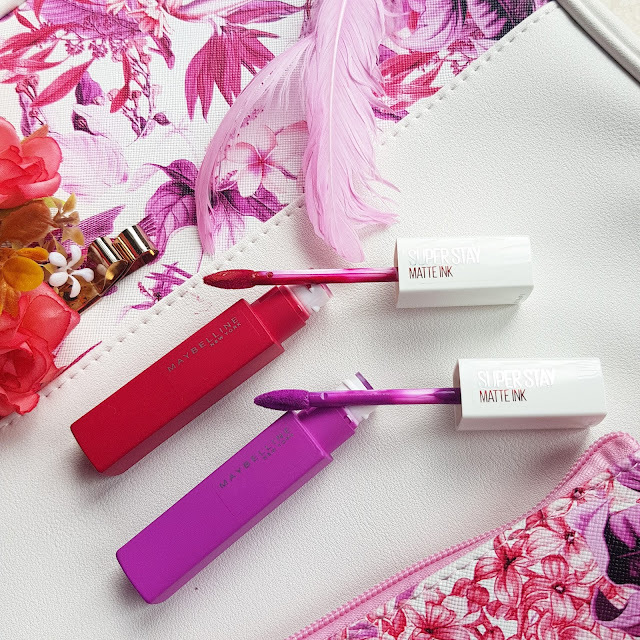 It has flocked sponge applicator which gives a perfect application to lips. Now coming to its texture its thick and creamy gives even application in one stroke. 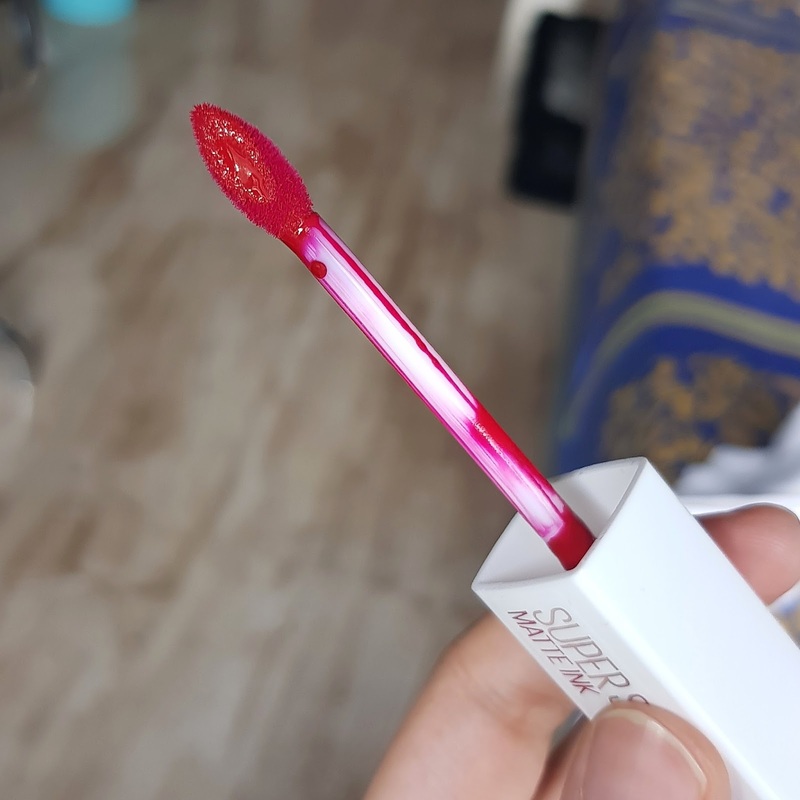 It’s a non drying formula which feels comfortable on my dry lips too. Doesn’t flake away or fade. Stays well for 7-8hrs without bleeding or feathering of the product. The colors are super saturated with the pigments and no doubt it gives complete opacity to pigmented lips too. I feel this is the longest lasting matte liquid lipsticks among all the drugstore lippies. 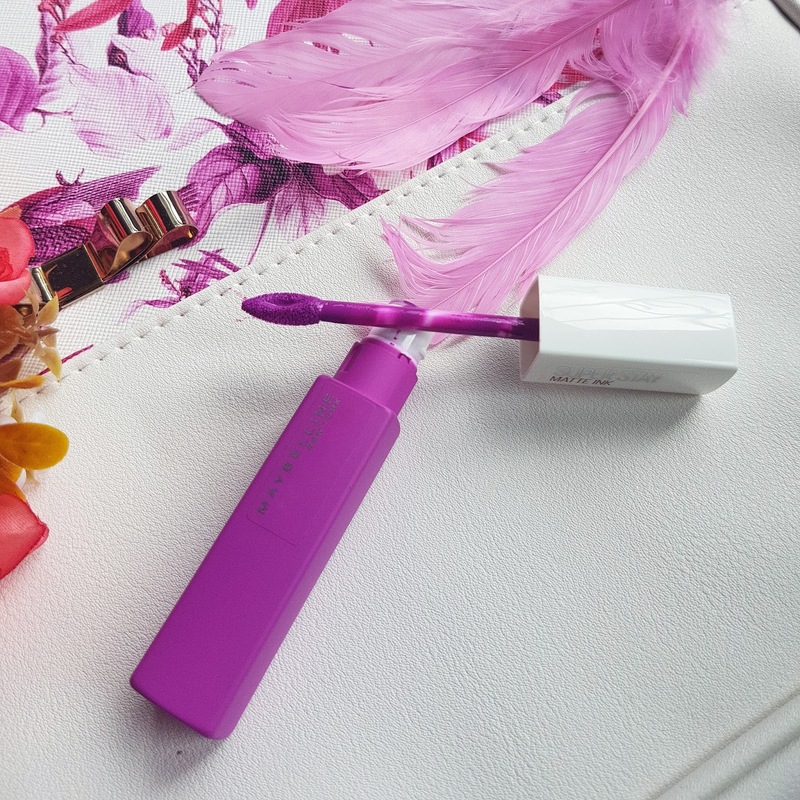 This lip color comes off easily with the makeup remover. Even the darkest shade doesn’t stain my lips. It does contains faint vanilla fragrance which doesn't last long. 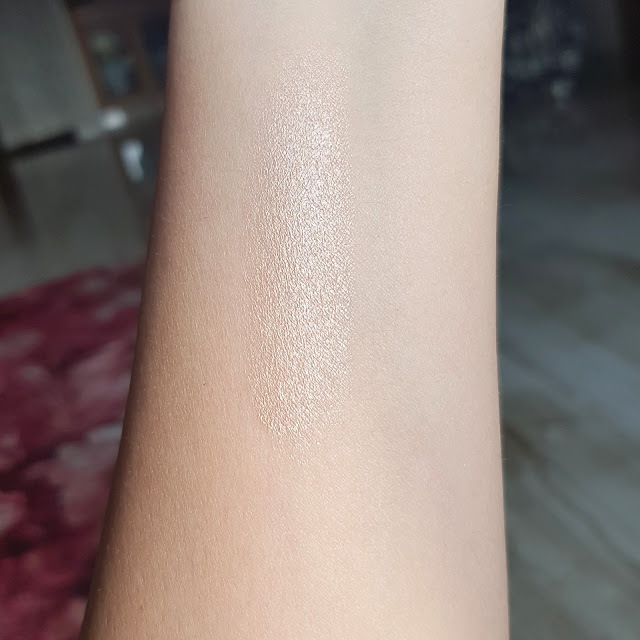 It does accentuate fine lines but doesn’t cling on to dry patches. The formula doesn't settles into fine lines. It claims to stay for 16 hrs but I really haven’t tried keeping it for so long. The formula after getting dry gives a little sticky feel to it which can feel uncomfortable on lips. As the texture is thick and creamy it gives a little heavy feel to it. Well the stickiness doesn’t last for long.. 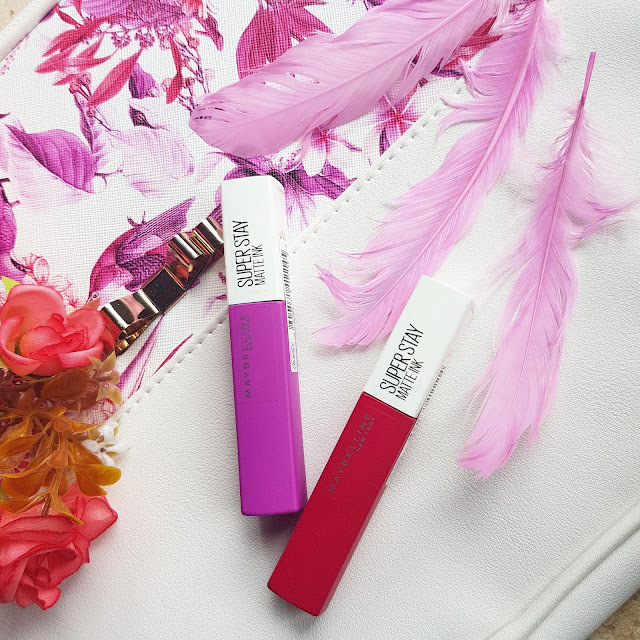 It gives a velvety matte finish to lips nothing which completely dries out your lips. The formula is completely waterproof and smudge proof. OVERALL RECOMMENDED. 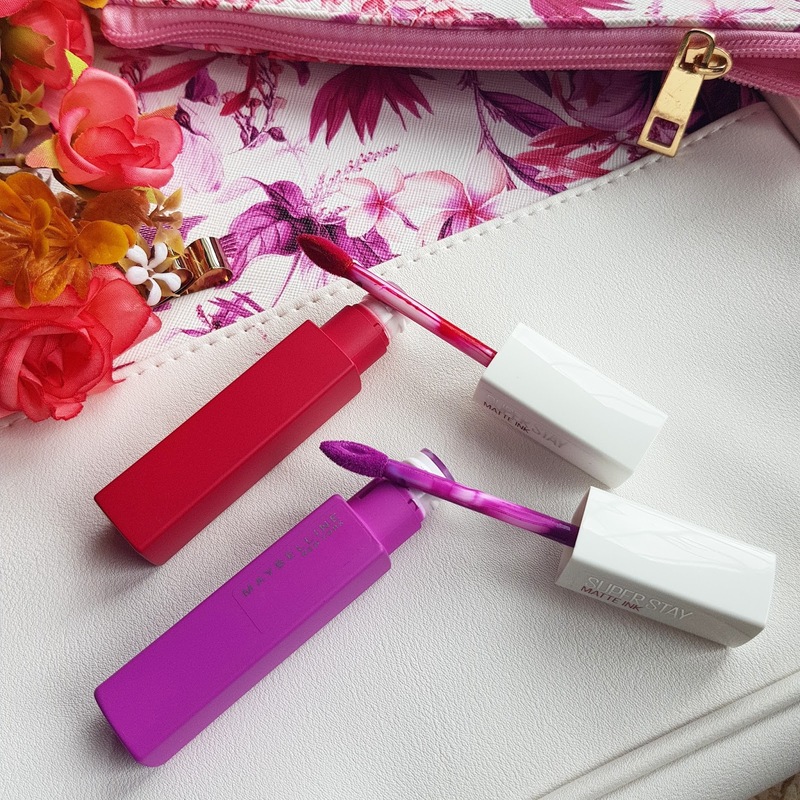 The shades are incredibly beautiful if you are looking for something which has amazing staying power and of course a matte liquid lipstick you need to try this out. PIONEER is beautiful bold red having cool tones. Its suitable for every skin tone. 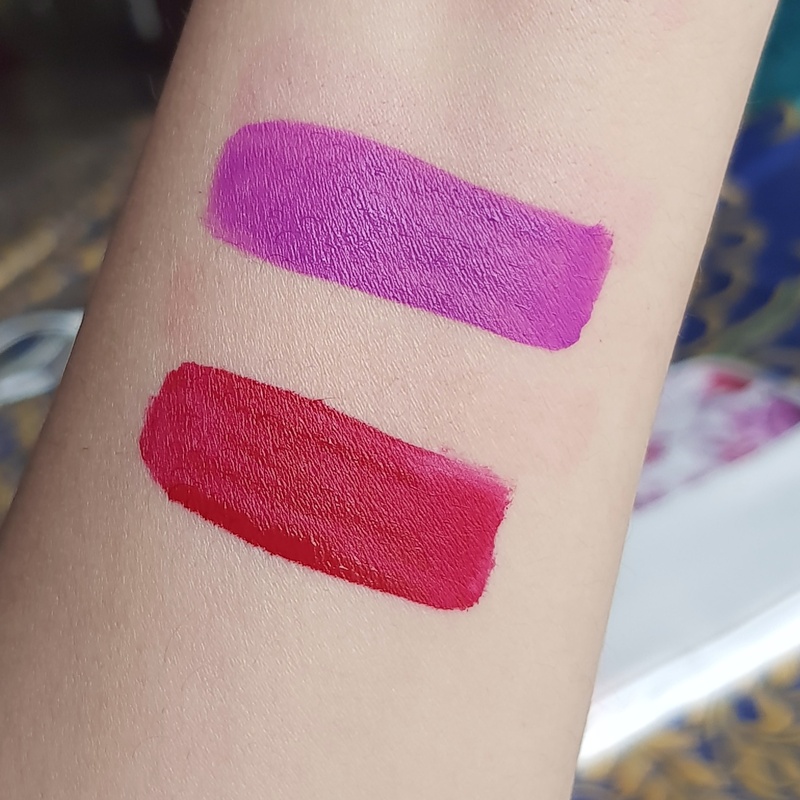 CREATOR is a gorgeous purple shade which is quite wearable by various skin tones.